This card is a 2-ply card. The gray border is actually a frame applied to the base card. There have been other cards published with frames like this but the 2004 and 2005 Donruss Diamond King sets took it to another level. I really like the 2004 set. I bought a box of these on eBay, paying, what is for me, an enormous price (I paid almost $90 for the 60-card box). But I really do love the cards. The base card Soriano is also shown below. The cards have a linen-type finish and have an old-timey look. 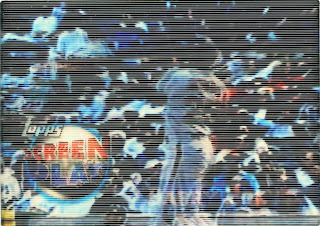 The color smudge behind the player looks a lot like what Topps is doing now with their Allen & Ginter cards. I just got this framed card in the mail. Besides it being a cool card, the other reason I decided to feature it is because, for me, it is a very frustrating set. I think that collecting the base set would probably not be too difficult. But, in general, I'm not a set collector. For me, I'd be happy to have a good collection of the base cards and also have at least one of each of the insert cards from the set. But for this set, such a goal is probably impossible. This set has 105 different insert cards. This isn't the worst set in this regard. 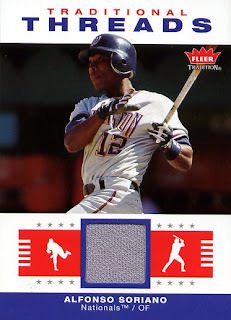 As soon as I get it, I'll be posting a card from the 2005 Prime Patches set, which as over 200 inserts. In the Diamond Kings set, most of the inserts are a variation on the base card and feature the same players as the base set. Here I've shown the base Soriano card and the framed silver card. The silver refers to the flavor of foil on the card. This same card is available as: Sepia, Bronze, Bronze Sepia, Platinum, Platinum Sepia, Silver, Silver Sepia, Framed Bronze, Framed Bronze Sepia, Framed Gold, Framed Gold Sepia, Framed Platinum Black, Framed Platinum Black Sepia, Framed Platinum White, Framed Platinum White Sepia, Framed Platinum Gray, Framed Platinum Gray Sepia, Framed Silver and Framed Silver Sepia. For those counting that's 20 Soriano cards with the same picture on them. Then there are 20 cards with the same picture and one or two relics. These follow basically the same pattern of frames and foil variations. Then there are another 20 cards, with the same variations but with an autograph. And most of these cards are serial numbered to anywhere from 1 to 150. Well, you get the picture. I could spend the rest of my life trying to collect all the inserts from this set. What do you get when you have a really hot, popular player left out of a card release? You get a poorly done bootleg card! I acquired this card somewhere around 1990 at a card shop that no longer exists. I knew it was a bootleg, just by looking at it. 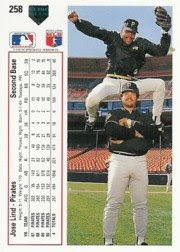 I knew Will Clark did not have an Olympic card in the 1985 set. I just wanted it to show to all my friends. I did. They all said that they didn't know that card existed. I said that it doesn't because it's fake! I think that impressed them even more. There were several things wrong with this card besides the obvious fact that it wasn't in the actual set. The graphic looks like it was produced on a low end printer. Those two facts sent red flags up even at the young age of 13. When I got the card in my hands, the card stock felt completely wrong. Not only that, it just didn't look right. The back didn't even try to pass itself off as Topps. It tried to pass itself off as an "Official USA Olympic Sponsor Card". It never said sponsor of what, exactly. Plus, on the back, it said that Will Clark was number 22. That was his Major League playing number. He is pictured wearing number 23 on the front of the card. He wasn't even a first baseman in the Olympic games. He played left field and DH. The back is plain white with minimal black text. I'm thinking that was a good way to go. They already screwed up the front. No one who collects cards is going to be fooled by a card like this. It's probably a good thing that whoever made this card didn't use the Topps logo on the front. Topps can be very sue-happy when it comes to trademark infringement and such. This is not the only bootleg card that I have in my collection. 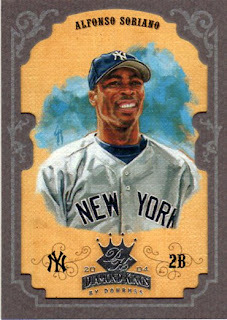 I have a few others, that don't blatantly rip-off designs from other baseball cards. They are cards of Bo Jackson pointing a bat at the camera in a White Sox uniform. I used to see those all over the place when he was first signed by the Sox. I have one with a black border and one in a shiny blue border. At least that's what I remember of them. I haven't took a good look at them in years. Those Bo Jackson cards also had some corny saying like, "What do you think I'm going to do this summer? ", or something like that. These cards usually fill some type of void. Others are downright malicious, like the 1963 Pete Rose rookie fake. The higher the value of a card, the more likely it is to be counterfeited. I can think of a few 1990 Frank Thomas cards that are highly bootlegged. Most, though, are trying to correct an oversight by the card company. That doesn't make it any better, but at least it shows that a few of them listen to the public's complaints. 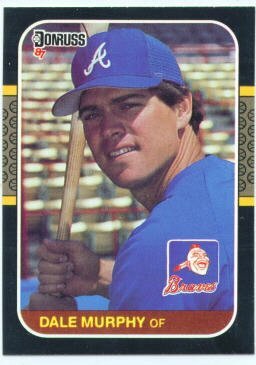 I can remember talk of how Topps could pick players like Mike Dunne over Will Clark. Can you? OK, I am really stretching the format of this blog here, since this is neither a card, or a thing done to a card, nor a thing done with a card. But it's baseball themed, and it's pretty cool. 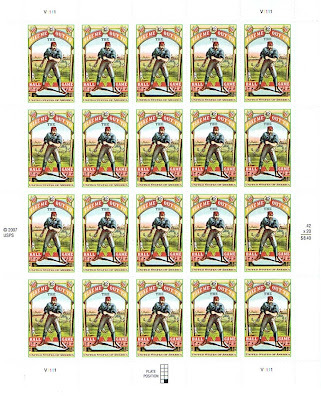 These are some stamps recently released by the USPS (despite the 2007 copyright date) commemorating 100 years of the song "Take Me Out to the Ball Game." Pretty damn nice stamp, eh? Back in the 1970s, dealers (and collectors?) Tom Collier and Mike Aronstein started producing cards under the acronym of their first and last names, TCMA. With hundreds of issues under their belt since then, the company's almost synonymous with "oddball." Well-known for their minor league team sets, they also used available baseball photos to remember plenty of retired sort-of-stars, fill out rosters of legendary teams like the 1927 Yankees, and even create issues that are more Americana than anything else. Clemente was the only recent player, but most count him as a legitimate all-timer. Hodges is comparatively marginal--and not even a HOFer--but probably benefited from managing the Mets to their 1969 series win. The back makes it easy to add your own story to the Babe's and pass it along to a friend. Not sure how many of these ended up stamped and mailed, but it'd be an interesting way to surprise someone with a trade in this day and age. If you posted one of these TCMAs by USPS or count them among your collection, let us know! A scan cannot do these cards justice. They are made out of plastic, and work sort of like the old Sportflics cards. But way better. 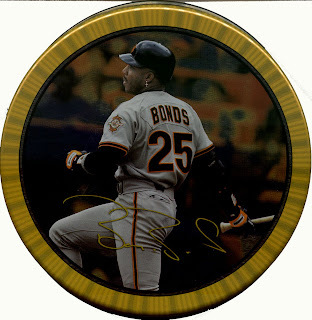 When you move the card you see, in this particular card, Barry Bonds taking a might swing. They are the same size as a regular baseball card, although thicker than normal. It's like stop motion animation. They've somehow embedded multiple images in the card. The surface of the card is like a prism (I guess) which only allows one image to be seen at a time, depending on the angle you're looking at it. This is how the Sportflics cards worked but these Screen Plays have many more images. The cards came in a round steel can, one card to a can. The cards were pretty expensive at $9.99 a pop. You knew who you were buying because the player in the can was featured on the can. The container was supposed to make you think of a roll of movie film. The card was cushioned in a slab of black foam, with a thiner slab of foam on top. In one of the three I bought, the foam has badly deteriorated and has actually left a residue on the card. The can is rusted as well. Perhaps water got in somehow. I noticed this maybe 5-6 years after I bought them. I removed the other cards from their cans when I saw this. There are several of these available on eBay right now, at a good price, considering what they cost when new. Ken Griffey's card is going for just 99 cents. This set was an ongoing set that started in 1859 and ran until 1891. These woodcuts predate the first cards by a decade. 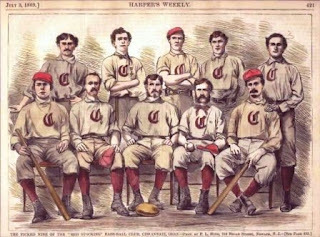 The example shown here is of the Cincinnati Red Stockings from 1869. It's always interesting, to me, to find early examples of baseball cards from the mid-nineteenth century. We are all familiar with the tobacco cards from around the turn of the twentieth century because of current releases like Allen & Ginter and Old Judge. It always brings a smile to my face to think that people were passionate enough about this sport, in its early days, to make images of their favorite teams and players. This was a time when printing these images was not the cheapest or easiest things to do. Some cards in this set were tinted, which was a popular method of colorization at the time. One can find traces of this procedure in the early silent films of the twentieth century. Some were tinted to capture a mood more effectively. Some were hand painted to add a splash of color to a specific item. There were at least 40 baseball related images during the run of this set. The cards were fund in the Harper's Weekly newspaper. Each card in the set differs in size. There was no standardization of size in those days. I'm guessing that whatever size they had to fill was what size they went with. It's amazing to find such detail and clarity in a woodcut from 1869. The colors are still sharp and the lines are still clearly visible. I would love to come across one of these originals in person. I'm almost positive that a picture of the woodcut does not exhibit the same amount of justice that an in person viewing can achieve. Well, maybe it doesn't exactly talk but it does play a recording when you press the button on the front. The recording is an announcer making the call of a Ken Griffey Jr. home run. The recording runs about 45 seconds. The quality is about what you get from one of those singing birthday cards. There is no information about the recording, like when the home run was hit, where, who's making the call, or anything. The card is the size of a regular baseball card but considerably thicker. It comes in a plastic case which has a space for the 4 button batteries it takes to play the recording. The case also has a little plastic tool to get the batteries into and out of the card. I got this in 2005, so it was already 7 years old. It came as a bonus in a box of repackaged cards. The batteries were starting to corrode but I cleaned them up and the darn thing worked. 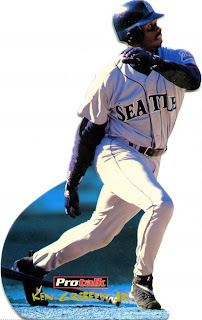 The card and its case were packaged in a blister pack with a Griffey stand up figure which is about 6 and a half inches tall. The stand up comes with a base which attaches to the stand up with a piece of double-sided tape. I could never get the base to stick on properly, so the thing is always falling over on my other non-baseball card stuff. 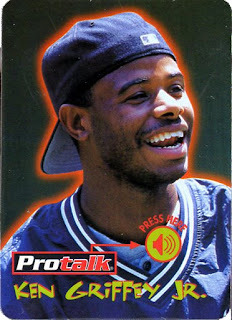 The ProTalk Griffey set had 4 Griffey cards. There was also a ProTalk set with 12 cards featuring other players. You can get the McGuire card right now on eBay. That will give you an idea of what the packaging looked like. There are also some NASCAR cards available on eBay as well. The card was produced by Telestar Interactive Corporation. This company is apparently still in business making Point-of-Purchase advertising displays and doing $4.1 million in business in 2007. They're headquarterd in Cincinnati. I found references to them on sites which give business information but they apparently don't have their own web site (or at least Google couldnt find it). Bowman's history imprints directly on this rare and special card. Their 1954 set initially included it--normal sized, of course--as #66. Unfortunately, Topps claimed an exclusive right to the Splinter for that year. Bowman showed the better part of valor and quickly pulled it in favor of fellow Boston outfielder Jimmy Piersall. Only a few originals made it into packs and the players became inextricably linked in the marketplace. Collectors know them colloquially as #66A (Williams) and #66B (Piersall). As beatific the expression and jaunty the cap angle, where'd the rest of Ted go? Looks about the size of a 1950 card, right? 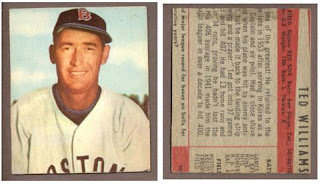 After starting small, Bowmans grew to match Topps' bigger efforts by 1954. Of course, kids are fickle and not everyone made the switch. Some laboriously trimmed their collection down to size, year after year, card after card. They'll see the light, thought one scissors-wielder just a year before noticing girls, those suckers will be back to normal in 1955. Low-grade but untrimmed #66As typically go for $250 - 300. Expect to pay a good deal less for the mini-Williams, but don't expect to see one. It's still a very rare card! If you can't wait, his 1954 Topps cards (#1 and #250) show up much more frequently and should run about $50. Of the two, Bowman's design is more interesting, but I honestly don't see the card often enough to get attached. Better one Piersall in the hand than a Williams never (ever) in the bush. To paraphrase Blazing Saddles, "Is Mungo only pawn in game of life?" 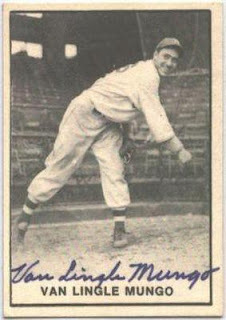 Van Lingle Mungo, a name so suited to a novelty record that someone couldn't help themselves, was also a quality Brooklyn pitcher for several years in the 30s and 40s. This card captures his joie de vivre for the game as well as some school-perfect penmanship. A recent listen to the song "Van Lingle Mungo" stirred memories of "Talkin' Baseball" and other novelty baseball tunes. It surprised and amused me that you can buy the song on Amazon now for five Pepsi points. Wonder how many of those points go to the composer? If we all jump on the bandwagon, would he have enough for the infamous Pepsi Harrier? These cards were made by the Fan Craze Company in Cincinnati. There was a set for the National League and a set for the American League. 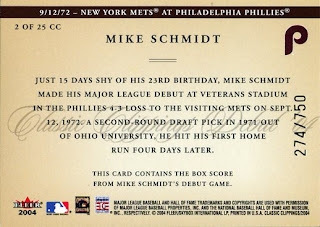 These cards featured an oval picture of the player with name and team information below. Plus, there was a baseball action at the top of the card, presumably to play some type of card game. The NL cards had a red back and the AL cards had a blue back. The card that I chose to represent the NL set is of Luther (Dummy) Taylor. 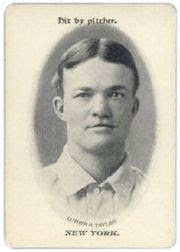 Luther is one of a handful of players to play organized baseball, that was deaf. Some might think that would be a disability that would prohibit them from playing baseball. That was definitely not the case. These cards have a strange allure to them. They definitely look like a turn of the twentieth century card. Topps has already come out with this design in their Trading Card History set. I believe Pedro Martinez is the subject on the card. I think one of the card companies should use this design for a retro card set. 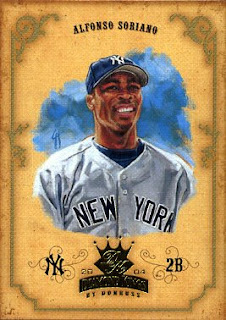 If handled properly, like the Allen & Ginter and Goudey sets, it would be a smash hit. 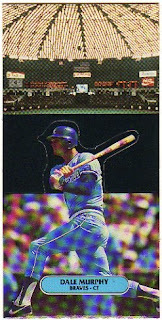 Maybe if Donruss gets their MLB license back, they can produce this retro set. The 'insert' in the card appears to be the box score cut from a newspaper. 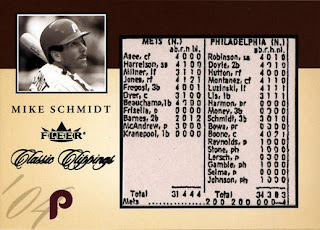 On the back of the card it says "This card contains the box score from Mike Schmidt's debut game". Mike's debut game was September 12, 1972. The card is serial numbered to 750 (this is numbered 274). Could this be an clipping from an actual 32 year old newspaper or is it a reproduction? Could they have found 750 newspapers from 9/12/72 to take the clippings? There are 25 cards in this set. Cards 1-20 have 750 copies, while 21-25 are limited to 100 copies. I don't know what the criteria is for the clippings on the other cards. If they are all debut games then most likely they would have had to come up with 15,500 old newspapers from very explicit dates. And some of these would be pretty old. For example, card #25 is Enos Slaughter, who debuted in 1938. I believe that the box score is a reproduction. How hard would it be to do that? I think if the clippings came from an actual newspaper it would say so explicitly on the card back. On the other hand, Beckett.com has images of 9 of these cards. They have the backs for some of them, and it looks like they are all debut game box scores. The box scores all look different, different type, different size, different layout. Maybe they are from actual newspapers. Whichever, it's a pretty cool card. 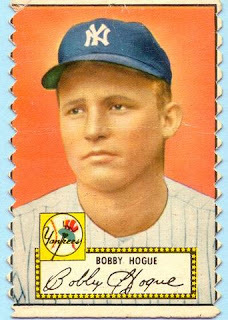 A collector whose name is lost to history, and perhaps deservedly so, decided the classic 1952 Topps design on Mr. Hogue's card wasn't artful enough. Did they not like the pinstripes? Too up-and-down, too geometric, too constrictive? It's hard to argue with the pizazz they added. Hard to argue when you're stunned speechless what people would do to a vintage Yankee card, anyway. Nuts, thinks Bobby. I'm on a contender. I coulda been somebody. Well-centered, crease-free, good eye appeal. Anything but a bum chop-job, which is what I am, let's face it. This card does feature sharp corners. 39 sharp corners. Typically people trim a card to "fix corner defects" or "true up mis-cut edges." Applying pinking shears to the problem is a novel approach, but I bet even PRO grading wouldn't cotton to this one. Most vintage collectors, and I'm right there with them, can't be picky on condition. This 1952 Hogue isn't from my own collection, but does present a little better than my set's "Hodges with a cigarette burn" and "Spahn that's sort of rectangular." Check out the lower left corner, though. Our card re-decorator didn't take just one bite at the apple, but came back for a second, touch-up pass. After all, if you're going to jump in, do it with both pointy, zig-zaggedy feet. This wasn't an insert, like most people believe. These Baseball Bucks were a test issue. The front of each buck would feature a headshot of a player, a small text about said player and a drawing of their home park. As far as I can tell, there were 96 different bucks. They featured minor stars of the day to future Hall of Famers. There are bucks of Hank Aaron, Ernie Banks, Yogi Berra, Don Drysdale, Nellie Fox, Al Kaline, Sandy Koufax, Mickey Mantle, Roger Maris, Eddie Mathews, Willie Mays, Brooks Robinson, Frank Robinson, Warren Spahn, Early Wynn and Carl Yastrzemski, among others. I'm not really sure why these didn't take off. They seem popular with collectors today. Maybe they weren't that popular with kids back in 1962. Whatever the reason, they are a bit of an oddity today. You can find these bucks if you are looking for them, but you're not going to just stumble across them easily. Most of these won't pop up in an eBay search unless you specifically put the word bucks along with your other descriptive words. Could this idea be revived today? It could be interesting to see players like Ichiro and Jim Thome on Baseball Bucks. I'm not sure they would be much more successful now. They would probably end up in the same place as Baseball Tattoos and Baseball Rub-Offs. Baseball Bucks might be fun for a deviation, but I can't see them being as popular as regular cards. That just might be the appeal though. This was the first of these things I've seen, and the only one I have. What exactly is it? As near as I can tell by squinting over the microscopic type in Beckett Baseball, the first of these may have been issued as inserts in 2004 Classic Clipping (a Fleer product). 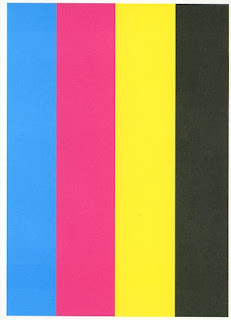 Those were called "print proofs" so may not have been the same thing but they did come in the four printing colors - Black, Cyan, Magenta, and Yellow. There were four for each card in the set, each in one of the four colors. 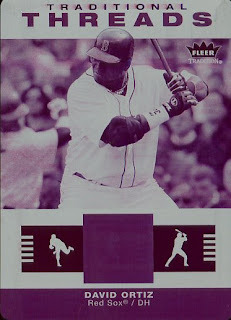 In 2005, most Bowman brands, Finest and the base Topps brand had "print plates", again 1 in each color for each card. The base Upper Deck set also had them. In 2006, virtually every Topps produced set had them, several Fleer sets had them and a couple of Upper Deck sets had them as well. They were also available in various sets in 2007 and 2008. Since this is called a "print plate" I have assumed that this thing was used to print the actual card. I'm not an expert on printing processes or colors, but apparently the four colors mentioned above can be combined to make a full color image. The colors are usually abbreviated CMYK (K for black). So what I have is the magenta plate. Baseball cards are printed on big sheets. So this thing must have been cut from the magenta plate. It's hard to tell in the scan but the thing has rounded corners. It's also made of aluminum. Another thing: The most common form of printing is called offset printing. In this process, the printing plate is inked from a rubber roller. Parts of the plate (the part which the printer wants to ink) is attractive to the ink (that is the ink sticks to it), while the other parts are not. The ink on the plate is then transferred to a rubber pad. 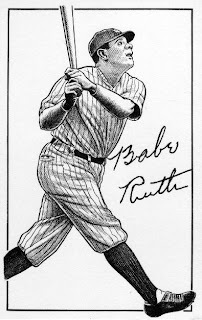 The image on the pad is then transferred to the print media (the paper, or in this case, a baseball card sheet). This explains why the image on the printing plate is in the same orientation as the card (and not a mirror image). So how do the different colors get made? I probably knew something about color theory at one time but I looked this up (like the other links) on Wikipedia. See that the bottom of the card is blue? The magenta plate is inked there as well. The cyan plate would also be inked there because cyan and magenta together give blue. The yellow and black plates would have no ink across the bottom. If the printing plates are cut up and distributed, does that mean that no more cards of that set can be printed? Probably not. I think new printing plates can be made, especially in this day and age when the original images are stored digitally on a computer. Back when tobacco cards were in their infancy, Allen & Ginter was producing everything from birds to baseball players to masters of different crafts onto its cards. It made the set interesting to collect and not just another throwaway item, which is what most people did with their cards. One of the odder sets, by today's standards, would be the Rifle Shooters series from 1888. Out of the four cards listed on this card's back, the oddest one would be Miss Annie Oakley. If a card was produced of a modern day woman surrounded by guns, there would be an outcry from politically correct people calling for banishment. Thankfully, the nineteenth century was a different time, in that respect. Thanks to the care that the Allen & Ginter company put into their "throwaway" product, there is an interesting and varied set left to collect today. Some of these cards can be had for a steal. Others, you will pay an arm and a leg for. In this regard, eBay is your new best friend. My only collecting interest in nineteenth century cards would be baseball players from the Sioux City Cornhuskers of the Western League, from 1894, and the St. Paul Apostles (also known as the Saints), from 1895 - 1899. I haven't found any examples of cards from these teams, but I haven't exhaustively searched for them either. For those of you complaining about the addition of other subjects than baseball players in the revival of Allen & Ginter cards from Topps, these oddball subjects were there from the beginning. Why change something that has worked since the nineteenth century? I ran across this image on a recent Google search. I've never really seen a card with four different aspects to it, in person. This has a game-used bat, a game-worn jersey, a game-worn hat and an autograph. The only thing that seems to be missing is the strand of hair. Normally, I avoid most things that are attached to the Cubs. In this case, I can't ignore the Expos factor. When I was growing up, I loved the Expos. Probably because no one else really cared. I was rooting for an Expos/White Sox World Series in 1994. But my joy would have to wait another eleven years for the White Sox half. The Expos didn't get off so lucky. As much as I try, I can't really get into rooting for the Nationals. Maybe if they were allowed to take the Senators name, it would be easier. There was just something about a French-Canadian baseball team that seemed odd. I instantly fell in love with them. It didn't hurt that the Expos produced some great players. The other teams around the majors just reaped the benefits of the Expos farm system. Andre Dawson is one of those guys that you just had to love. He did a little bit of everything, but everything he did usually turned out well. I was always fascinated by his signature. It seemed so perfect. I bet he aced penmanship in school. The other thing that I like about this card is the presence of the Expos. I rarely see cards of Expos anymore. Especially cards with game-used items. 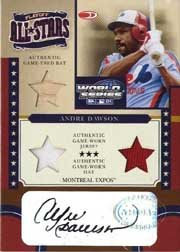 I think that the Expos budget was used on this card alone. This could have made four great cards. Instead, it makes one superior card. Over the years, Post Cereal has produced many different sets of baseball cards. They used to actually come in a box of cereal, sometimes with a redemption coupon to get the whole set for a bunch of boxtops. 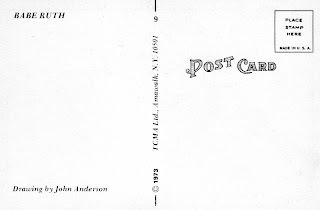 In 2003, Post produced a 31 card set, which came in a little box. The cards were actually made by Upper Deck. I don't know how Post distributed them. I got three sets in repack boxes. They used to sell these boxes in Toys R Us, where packs of cards were glued (with extremely strong glue) to a cardboard box (with just sides) and then the box was put into another box which had windows on the side so you could see what packs you were going to get. There was also a special surprise in the interior which you couldn't see. I got a few weird baseball things in those boxes. These Post cards were pretty nice and featured all the big stars. I got this odd card in one of the sets. I have no idea of what its supposed to be. My guess is that the cards were printed on a sheet which held 32 cards but since the set only had 31 cards (what, they couldn't find one more player who was good enough? ), the blank space had this rainbow thing. Since only one of the sets I got has this, I'm sure it wasn't supposed to get in the box. 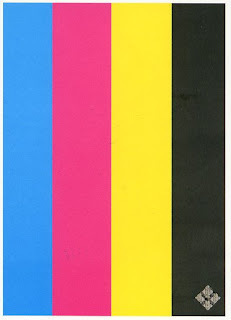 You can't tell from the scan but the rainbow has a solid white border. The best part about it is that it has the Upper Deck holographic logo on the back, which, of course, is the only way to tell it's the back. Some think almost 400 homers, back-to-back MVPs, and six different seasons slugging over .500 make a case for the Hall of Fame. Murphy certainly scared pitchers more than most hitters in the 1980s, even given a penchant for striking out. This photo clearly happens after contact, perhaps with Dale shooting another double into the left-center gap. As good as card photography gets these days, it was sub-par during the 1980s and well-timed shots like this were few and far between. The same company's regular issue from that year went with a is-he-hunky-or-dreamy shot and even his 1987 Diamond King looks distracted. At least the pop-up puts us into the game. Once you punch out the card and stand Dale up, I can't help but notice the copious Astrodome advertising just past his shoulders. Around the outfield, it's the Marlboro man, Budweiser, Coke, and FirstCity Bank. OK, Coke is acceptable for kids, but ciggies and beer? Did we learn nothing from the airbrush arteests of the late 1970s? I imagine a Friday-night-working editor seeing the ads in the background, scratching the crown of his thinning scalp, and saying "screw it, it's just a gimmicky pop-up set." While going through my boxes of older cards, picking out cards for trades, I was stopped in my search by this card. I just want to know two things. How did Jose Lind get that high? I don't see any trampolines or wires. Plus, which direction was Jose going? If Jose was moving towards Spanky LaValliere, there could be a painful collision momentarily. Either that, or Jose felt compelled to ride Spanky like a horse. Maybe Jose was inspired by those old westerns in which the hero jumps from danger by exiting a second story window onto his trusty horse below. I always thought that was a bit cruel to the horse. I wouldn't want anyone I'm friends with jumping ten feet above me onto my back. I'd probably injure my spine. The photo reminds me of a quote from Mel Brooks' film Robin Hood: Men In Tights. Isaac Hayes is speaking to Cary Elwes about his son Dave Chappelle. There's nothing really dirty about the quote but it's very suggestive, so I won't type it here. Fans of the film already know what I'm talking about. "... or is it the other way around?" Any way you slice it, this is a pretty awesome picture that probably should've been on the front of the card.